Can I upgrade to macOS Mojave? When you connect an external hard drive directly to your Mac, you might be asked if you want to use the drive to back up with Time Machine. Click “Use as Backup Disk.” If you select the option to encrypt, your backups will be accessible only to users with the password. Open Time Machine preferences from the Time Machine menu in the menu bar. Or choose Apple menu () > System Preferences, then click Time Machine. Click Select Backup Disk, Select Disk, or Add or Remove Backup Disk. Select a backup disk from the list, then click Use Disk. For additional backup security and convenience, you can repeat these steps to add another backup disk. For example, you might use one backup disk while at home, and another backup disk while at work. After you set up Time Machine, it automatically makes hourly backups for the past 24 hours, daily backups for the past month, and weekly backups for all previous months. The oldest backups are deleted when your backup drive is full. To back up now instead of waiting for the next automatic backup, choose Back Up Now from the Time Machine menu . 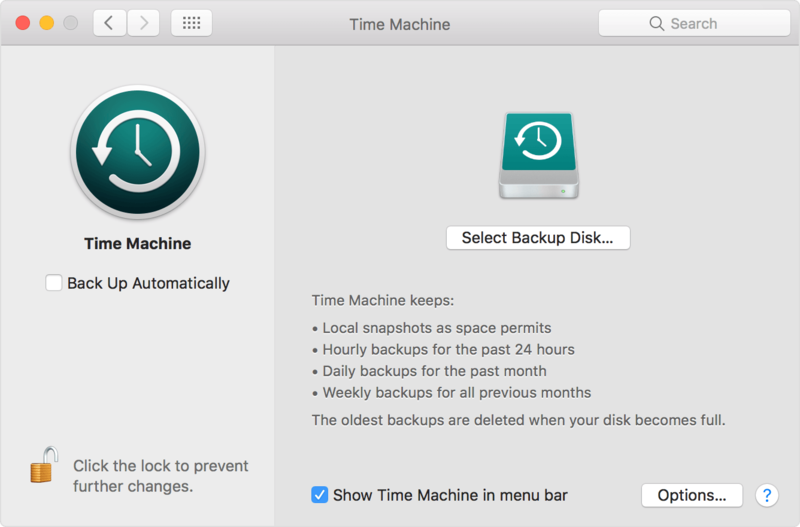 To stop automatic backups, open Time Machine preferences, then either deselect Back Up Automatically (macOS Sierra) or turn off Time Machine (OS X El Capitan or earlier). You can still back up manually by choosing Back Up Now from the Time Machine menu. To cancel a backup in progress, choose Skip This Backup (or Stop Backing Up) from the Time Machine menu. To check backup status, use the Time Machine menu. The icon shows when Time Machine is backing up , idle until the next automatic backup , or unable to complete the backup . To exclude items from your backup, open Time Machine preferences from the Time machine menu, click Options, then click and select the item to exclude. Your first backup may take a long time, depending on how many files you have. You can continue using your Mac while a backup is underway. Some Mac computers make backups even when asleep. Time Machine backs up only the files that changed since the previous backup, so future backups will be faster. Choose Enter Time Machine from the Time Machine menu , or click Time Machine in the Dock. Use the timeline on the edge of the screen to see the files in your Time Machine backup as they were at that date and time. The timeline may also include local snapshots. Use the onscreen up and down arrows to jump to the last time the contents of the window changed. You can also use the search field in a window to find a file, then move through time while focused on changes to that file. Select a file and press Space Bar to preview the file and make sure it's the one you want. Click Restore to restore the selected file, or Control-click the file for other options. To restore everything in your Time Machine backup, use macOS Recovery. To copy the files, settings, and user accounts in your backup to another Mac, use Migration Assistant. Time Machine notifies you whenever it cannot complete a backup. To make sure that a backup is good, hold down the Option key, then choose Verify Backups from the Time Machine menu. 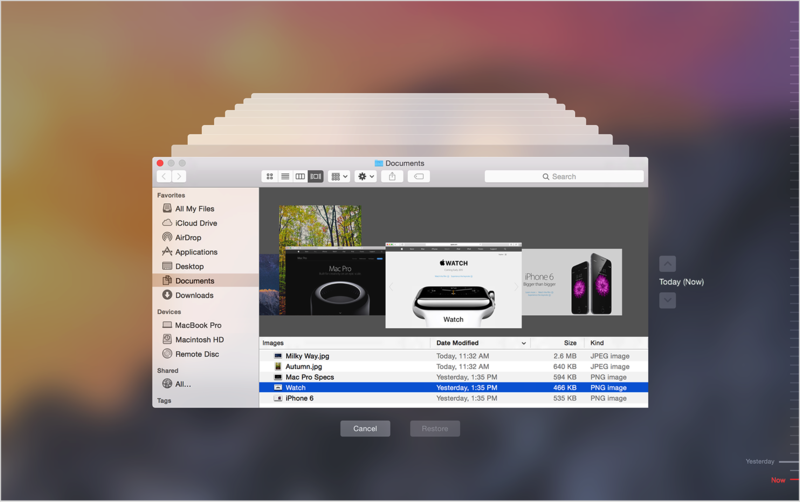 Learn what to do if you cannot back up or restore with Time Machine. If you back up to multiple disks, you can switch disks before entering Time Machine. Hold down the Option key, then choose Browse Other Backup Disks from the Time Machine menu. If you are using a Time Capsule, your first backup might be faster if it is in the same room as your Mac, or connected directly to your Mac with an Ethernet cable. Learn more. After you choose your backup disk, its icon in the Finder might or might not be the same icon that you see in Time Machine preferences. You can change the icon if you want. In OS X Lion v10.7.3 or later, you can also start up from your Time Machine disk, if necessary. Hold down the Option key as your Mac starts up. When you see the Startup Manager screen, choose “EFI Boot” as the startup disk.